is a prefecture of Japan located in the Tohoku region on Honshū island. Its capital is Yamagata. The aboriginal Ezo people (蝦夷) once inhabited the area now known as Yamagata. During the Heian Period (794–1185), the Fujiwara (藤原) family ruled the area. Yamagata City flourished during the Edo Period (1603–1867) due to its status as a castle town and post station, famous for beni (red safflower dye used in the production of handspun silk). In 1649, the famous haiku poet, Matsuo Bashō visited Yamagata during his five-month trip to the northern regions of Japan. Yamagata, with Akita Prefecture, composed Dewa Province until the Meiji Restoration. Yamagata Prefecture is the largest producer of cherries and pears in Japan. A large quantity of other kinds of fruits such as grapes, apples, peaches, melons, persimmons and watermelons are also produced here. Carp, Yonezawa koi 米沢　鯉 is a speciality of Yonezawa city, former castle town of the Uesugi clan. Pure water and the intense cold of winter work on the carp of Yonezawa, with absolutely none of the smell of mud peculiar to ordinary river fish; Yonezawa Carp are shipped after not two, but three years. The flavor lies in the climate, soil and water well-suited to rearing and also in painstaking efforts involved in raising. Sukiyaki, shabu-shabu and steak are all delicious. There is also soybean paste-pickled beef as a delightful gift. The fat of the meat is soft and stays soft when cold, so it is suitable for station lunchboxes. Station Lunchbox with hashed meat and small cuts of meat, flavored in a special sauce with soysauce, sake and secret ingredients. A simple dish, where the meat is combined with the local rice variety, Domannaka, which is good for taking on the flavor of gravey. gyoojana 行者菜 Gyojana, "green chives for mountain ascetics"
hippari udon ひっぱりうどん "pulling at udon noodles"A pack of natto and some saba from the can is mixed in a bowl, then rings of leek and soysauce are mixed to make a sauce, where the boiled udon (which are served in a big pot and all can take their share) are now put in. They are mixed until the sauce has covered them well and then ... slurp ... all is eaten. imoni (いもに)　芋煮 "boiled satoimo taro potatoes"
This dish originated in Yonezawa, Yamagata, being prepared outdide in large pots for a crowd to enjoy the cool evenings. It is made from sato-imo taro roots, leek, konnyaku and local beef, the broth flavored with soy sauce. This has migrated to other parts of Japan, with other ingredients and even miso for the broth ! 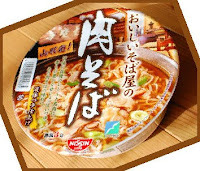 But the real inhabitants of Yamagata dislike a broth with pork, for example. Thousands of people have enjoyed potato stew cooked in a giant pot at an annual event in Yamagata City, northern Japan. The organizers began cooking the stew in a 6-meter diameter pot on Sunday morning. They used 1,200 kilograms of beef, 3,000 kilograms of taro potatoes and 3,500 Japanese leeks. Thirty-thousand servings were sold for 300 yen, or about 4 dollars. The organizers checked the radiation levels of the ingredients due to concerns about possible contamination from the accident at the Fukushima Daiichi nuclear plant. They also invited 120 people who had to evacuate their homes because of the March 11th disasters. The chief organizer, Akira Kaitou, says he hopes everyone will feel happy about eating tasty food from Yamagata Prefecture. kujira mochi くじら餅 "whale mochi cakes""
it is serverd cold, "Cool Niku Soba"
The leaves have been used as food in the Yonezawa area since the Edo period, when the daimyo Naoe Kanetsugu 直江 兼続（なおえ かねつぐ 1560 - 1619） made them plant this trees for fences around the homes and have some food in times of need. Kanetsugu gave up fighting Ieyasu (he had no chance to win) and was reduced in force to live in Yonezawa. yukina ゆきな / 雪菜 "snow leaves"
The plant is harvested in october, put back into the earth and covered with straw. Now the deep snow of Yamagata covers it for some weeks to make it more eatable and sweet. It can be dug out all winter, it tasts slightly of wasabi. fusubezuke, fusube zuke ふすべづけ "hot water pickles"
It is difficult to dig out in winter and its planting was almost stopped. Now some farmers try to revive the habit of eating this leafy vegetable. Traditional techniques and flavor handed down from generation to generation. Enjoy our hospitality with our hand-made soba. Yamagata has many varieties of soba noodles. Each soba restaurant has it's own taste and style. There is a “city style soba”, which can be eaten smoothly. Also, there is a “country style soba”, which is simple and plain, but has a great soba aroma. If you visit Yamagata, you will definitely be able to find a soba type which suits you. We have “Gassan Sansai Soba”, where you dip cool soba noodles into a pot of mountain vegetable and mushroom soup. Another soba is cool “Niku Soba” which has chicken and leek on top of the soba. This was started in Kahoku-machi. Also, We have “Gesoten soba”, which has a deep-fried squid on top of the soba. Especially, There is “Ita soba”, which used to be served in a big in the farmer meeting. You can enjoy the vestige of their old style. People in Japan’s Yayoi period may have already been engaged in carp farming for winter storage, a group of researchers said Thursday, based on a recent study on fossils of young carp’s teeth discovered at a major archeological site. According to the group, the analysis based on the discovery at the Asahi site in Aichi Prefecture, a huge moated settlement from the 4th century B.C. to the 4th century A.D., marks the earliest illustration of carp farming in Japan. ‘‘I suppose Yayoi people released carp in the spawning season into rice fields, moats or ponds, and that the fish produced eggs—a primitive farming probably started in such a way,’’ said Tsuneo Nakajima, a senior curator specializing in fish ecology at the Lake Biwa Museum in Shiga Prefecture, which analyzed the fossils. The finding is also significant because people in the Yayoi period had been thought to have procured food mainly by hunting and gathering, the researchers said. ***** . Folk Toys from Yamagata .